Swing Containers can be described as a special component that can hold the gathering of components. It will have the capability to provide the gap to put the components. Swing tool kit provided the two types of Swing Containers they are top level containers and low level containers, top level containers are heavy wait Swing Containers such as JFrame, JApplet, JWindow, JDialogue and low level Swing Containers are light weight containers such as JPanel. The commonly used containers are JFrame, JPanel, JWindow. 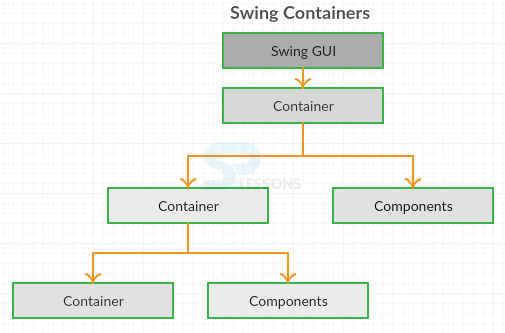 The difference between the component and container is that component is an object that can provide the visual representation, where as container is also a component that can hold the gathering of components as follows. JPanel is a light weight Swing Containers and used to gather the all the components. The basic declaration of JPanel is as follows. Below is the source code to build panel in Swing. Create a class that should extend JFrame and include labels, text fields, button component. Create a constructor, create a panel with GridBagLayout manager. Set the border for the panel and add to the frame. Set the look and feel of window application. Output will be as follows.Where created one text field, password field, login button also and created look & feel to the window application as follows. JFrame is a top level container of the Swing and heavy weight container. 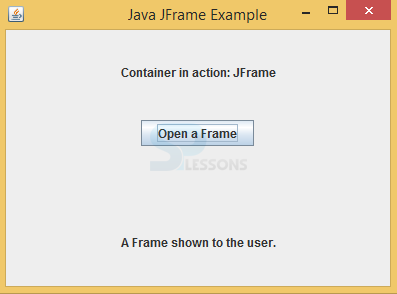 JFrame is an extension form of java.awt.Frame. On which other components will be placed such as panels, text field. The basic declaration of JFrame is as follows. Below is the source code to build frame in Swing. Create a class, main frame, labels and create constructor also. Create the title to the window and set the layout, add listeners to the components. Create the message label also that should be in center of the window that is “Wrlcome to SPlessons”. Set the header label that is”Container in action: JFrame”. Create the component button as “open a Frame”. If user click on this button another window will be opened that shows “Welcome To SPlessons” message. Output will be as follows. It shows header label message and status label message is as follows. When user click on open a frame button “Welcome To SPlessons ” message will be opened. 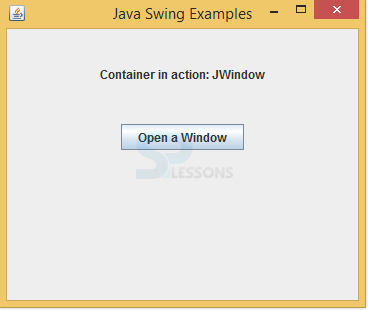 JWindow is a low level container and light weight container, by default it uses the BorderLayout. The basic declaration of JWindow is as follows. Below is the source code to build window in Swing. msglabel = new JLabel("Welcome to SPlessons." Create the main method and create the object to the class. Add grid layout to the main frame and WindowListener to the main frame. Create message label, header label, status label and add this labels to main frame. Create the open window button and add Listeners to the button, when user click on this button another message window will be opened. Output will be as follows.It consists of header message and status message. When click on “open a window” button then it displays the output as follows. 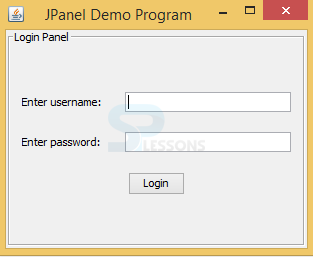 JPanel can add colors to the window. Swing Containers can hold the other containers also. JPanel can change the look and feel of the window application.